I'm convinced that hackathons are the best way to get geoscientists and engineers inventing and collaborating in new ways. They are better for learning than courses. They are better for networking than parties. And they nearly always have tacos! If you are unsure what a hackathon is, or why I'm so enthusiastic about them, you can read my November article in the Recorder (Hall 2015, CSEG Recorder, vol 40, no 9). The next hackathon will be 28 and 29 May in Vienna, Austria — right before the EAGE Conference and Exhibition. You can sign up right now! Please get it in your calendar and pass it along. Colorado School of Mines has dominated the student showing at the last 2 autumn hackathons. I know there are plenty more creative research groups out there. Come out and show the world your awesomeness — in teams of up to 4 people — and spend a weekend learning and coding. Also: there will be beer. To everyone else: this is not a student event, it's for everyone. Most of the participants in the past have been professionals, but the more diverse it is, the more we all get out of it. So don't ask yourself if you'll fit in — you will. Our previous hackathons have been free, but this one has a small fee. It's an experiment. Like most free events, no-shows are a challenge; I'm hoping the fee reduces the problem. If the fee makes it difficult for you to join us, please get in touch — I do not want it to be a barrier. Just to be clear: these events do not make money. Previous events have been generously sponsored — and that's the only way they can happen. We need support for this one too: if you're a champion of creativity in science and want to support this event, you can find me at matt@agilegeoscience.com, or you can read more about sponsorship here. The dates are 28 and 29 May. The event will run 8 till 6 (or so) on both the Saturday and the Sunday. We don't have a venue finalized yet. Ideas and contributions of any kind are welcome — this is a community event. Acquisition optimizer: lay out the best geometry to image the geology. Human inversion: add geological layers to match a seismic trace. Drill wells on a budget to make the optimal map of an unseen surface. Which geological section matches the (noisy) seismic section? Top Trumps for global 3D seismic surveys, with data scraped from press releases. Set up the best processing flow based for a modeled, noisy shot gather. It's going to be fun! If you're traveling to EAGE this year, I hope we see you there! Photo of Vienna by Nic Piégsa, CC-BY. Photo of bridge by Dragan Brankovic, CC-BY. Last week, I travelled to Norway and held a two day session of our Agile Geocomputing Training. 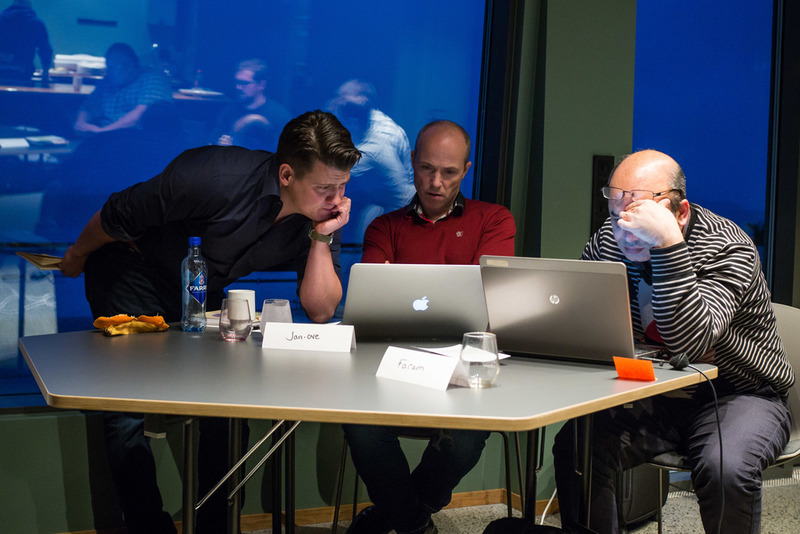 We convened at the newly constructed Innovation Dock in Stavanger, and set up shop in an oversized, swanky kitchen. Despite the industry-wide squeeze on spending, the event still drew a modest turnout of seven geoscientists. That's way more traction then we've had in North America lately, so thumbs up to Norway! And, since our training is designed to be very active, a group of seven is plenty comfortable. A few of the participants had some prior experience writing code in languages such as Perl, Visual Basic, and C, but the majority showed up without any significant programming experience at all. The first day we covered basic principles or programming, but because Python is awesome, we dive into live coding right from the start. As an instructor, I find that doing live coding has two hidden benefits: it stops me from racing ahead, and making mistakes in the open gives students permission to do the same. Using geoscience data right from the start, students learn about key data structures: lists, dicts, tuples, and sets, and for a given job, why they might chose between them. They wrote their own mini-module containing functions and classes for getting stratigraphic tops from a text file. Since syntax is rather dry and unsexy, I see the instructor's main role to inspire and motivate through examples that connect to things that learners already know well. The ideal containers for stratigraphic picks is a dictionary. Logs, surfaces, and seismic, are best cast into 1-, 2, and 3-dimensional NumPy arrays, respectively. And so on. We've seen it time and time again. People really like the format of Jupyter Notebooks (formerly IPython Notebooks). It's like there is something fittingly scientific about them: narrative, code, output, repeat. As a learning document, they aren't static — in fact they're meant to be edited. But they aren't so open-ended that learners fail to launch. Professional software developers may not 'get it', but scientists really subscribe do. Start at the start, end at the end, and you've got a complete record of your work. You don't get that with the black-box, GUI-heavy software applications we're used to. Maybe, all legitimate work should be reserved for notebooks: self-contained, fully-reproducible, and extensible. Maybe notebooks, in their modularity and granularity, will be the new go-to software for technical work. By the end of day two, folks were parsing stratigraphic and petrophysical data from text files, then rendering and stylizing illustrations. A few were even building interactive animations on 3D seismic volumes. One recommendation was to create a sort of FAQ or cookbook: "How do I read a log? ", "How do I read SEGY? ", "How do I calculate elastic properties from a well log?". A couple of people of remarked that they would have liked even more coached exercises, maybe even an extra day; a recognition of the virtue of sustained and structured practice. The reason we use colourmaps is to facilitate the human eye in interpreting the morphology of the data. There are no hard and fast rules when it comes to choosing a good colourmap, but a poorly chosen colourmap can make you see features in your data that don't actually exist. Colourmaps are typically implemented in visualization software as 1D lookup tables. Given a value, what colour should I plot it? But most spatial data is multi-dimensional, and it's useful to look at more than one aspect of the data at one time. 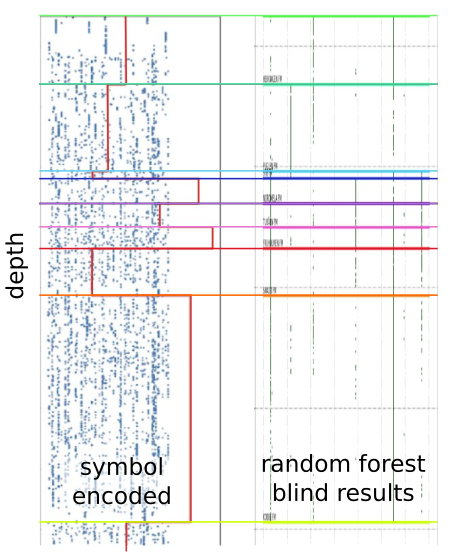 Previously, Matt asked, "how many attributes can a seismic interpreter show with colour on a single display?" He did this by stacking up a series of semi-opaque layers, each one assigned its own 1D colourbar. Another way to add more dimensions to the display is corendering. This effectively adds another dimension to the colourmap itself: instead of a 1D colour line for a single attribute, for two attributes we're defining a colour square; for 3 attributes, a colour cube, and so on. Let's illustrate this by looking at a time-slice through a portion of the F3 seismic volume. A simple way of displaying two attributes is to decrease the opacity of one, and lay it on top of the other. In the figure below, I'm setting the opacity of the continuity to 75% in the third panel. At first glance, this looks pretty good; you can see both attributes, and because they have different hues, they complement each other without competing for visual bandwidth. But the approach is flawed. The vividness of each dataset is diminished; we don't see the same range of colours as we do in the colour palette shown above. Overlaying one map on top of the other is one way to look at multiple attributes within a scene. It's not ideal however. The lightness value of the seismic amplitude time slice has been modulated by the continuity attribute. Such a composite display needs a two-dimensional colormap for a legend. Just as a 1D colourbar, it's also a lookup table; each position in the scene corresponds to a unique pair of values in the colourmap plane. In order to achieve this effect in most conventional software, you usually have to copy the attribute, colour it black, apply an opacity curve, then position it just above the base amplitude layer. Software companies call this workaround a 'workflow'. Are there data visualizations you want to create, but you're stuck with software limitations? In a future post, I'll recreate some cool co-rendering effects; like bump-mapping, and hill-shading. To view and run the code that I used in creating the images for this post, grab the iPython/Jupyter Notebook. If you're in Calgary, Houston, New Orleans, or Stavanger, listen up! If you'd like to gear up on coding skills and explore the benefits of scientific computing, we're going to be running the 2-day version of the Geocomputing Course several times this fall in select cities. To buy tickets or for more information about our courses, check out the courses page. None of these times or locations good for you? Consider rounding up your colleagues for an in-house training option. We'll come to your turf, we can spend more than 2 days, and customize the content to suit your team's needs. Get in touch.